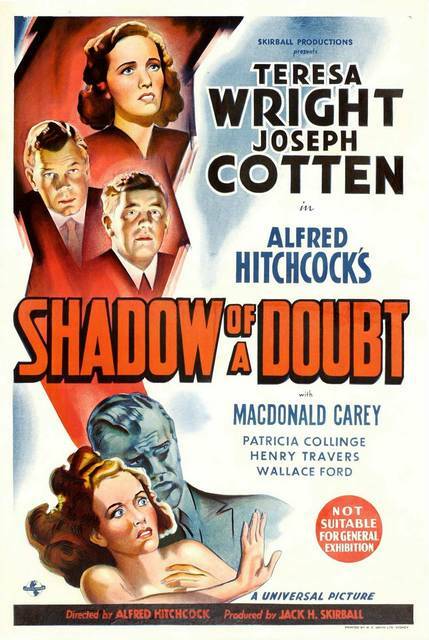 GREENVILLE – Alfred Hitchcock’s 1943 film “Shadow of a Doubt” is a suspense classic that continues to unnerve audiences to this day. When Charles Oakley (Joseph Cotten) arrives at this sister’s home in California, the entire family is happy to see him, especially his niece and namesake, Charlie (Teresa Wright). But when two detectives show up in town looking for the Merry Widow Murderer, Charlie begins to suspect her uncle might not be the man she thinks he is. Co-written by Thornton Wilder (Our Town), the film plays on the peculiarities of small towns and close families to weave a web of intrigue as tantalizing as it is troubling. Joseph Cotten is perfectly cast, projecting sinister suspicion one minute and affable charm the next, tugging poor Charlie’s loyalties in opposite directions as she learns more about his crimes. Teresa Wright does her own balancing act as Charlie, moving between fresh-faced innocence and shrewd scheming as she seeks to protect her naïve parents and younger siblings from the danger in their peaceful home. Join other guests at 6:30 p.m. Nov. 6 at the Greenville Public Library as the library screens this classic thriller as part of GPL’s Third Floor Film Series. Free popcorn, candy and soft drinks will be provided, and David Nilsen will lead a brief discussion after the film.